Need a breath of fresh air? Get easy breezy with us in coastal California while we take a glimpse into the textile art studio of Sharon Gellerman for ColorVibe Design. Using fabric as her canvas, our designer transforms each piece of silk into a unique piece of wearable art. Come along to sunny San Luis Obispo in this edition of "How it's Made." The silk marbling technique Sharon applies to her creations is classical, originating in China many centuries ago. In her home studio, layers of colorful dyes are applied to a solution of water and cellulose that allows the dyes to float above the liquid. Using custom-made combs, the layer of colors are manipulated into individual designs. The fabric is then placed atop the composition, and the dyes are absorbed. The interaction of the dyes in the marbling process is naturally unpredictable, a challenge Sharon welcomes and finds inspiring. 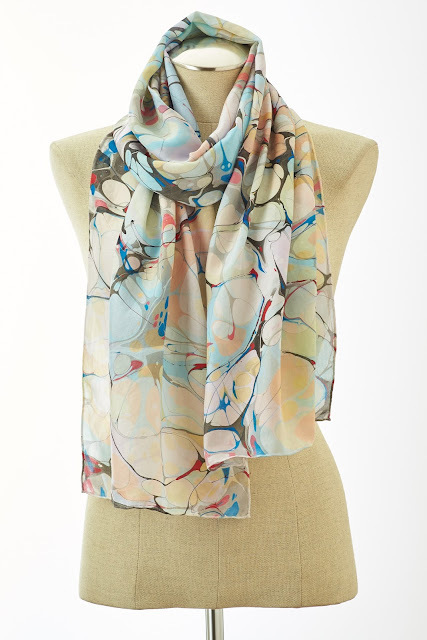 An amalgam of intention and chance, each scarf is truly one-of-a-kind. The suffusion of serendipity with cascading color defines Sharon's hand-marbling technique. 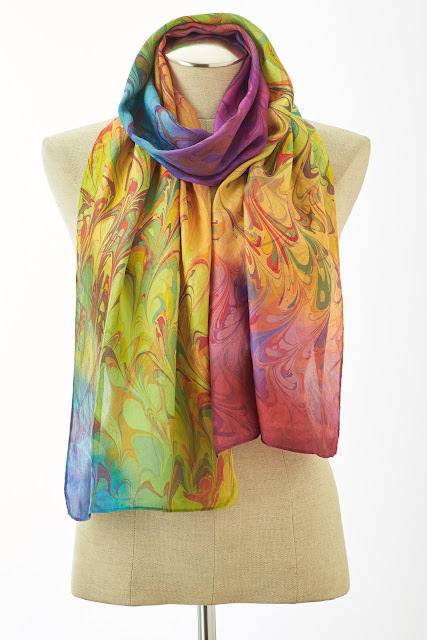 It is her hope that her silk scarves are a feast for the eyes and a lift to the spirits for all who see them. And those are some good color vibes!